Nutrition on a Post-It Note? Maybe you’ve heard that physicians typically take less than one nutrition class in their entire pre-med and medical school curriculum. 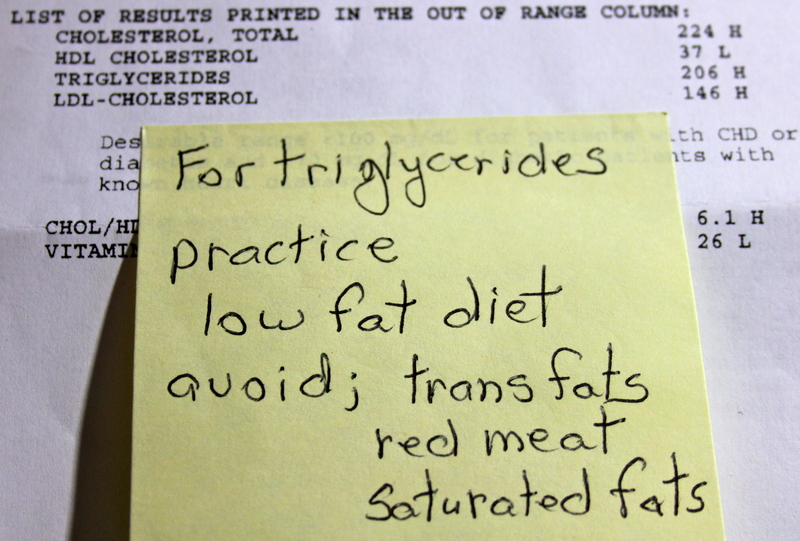 But did you know that the typical family physician expects their patients to learn all necessary nutrition from advice on a Post-It Note? This is an actual test result mailed from an actual physician’s office to an actual patient – my darling husband. He’s lucky to have a Health Coach living in his house, because we can work together on a realistic, achievable plan to address this important health matter. If you aren’t lucky enough to be living with a Health Coach, what would you do with this advice? How would you know what steps to take to put it successfully into practice? Do you have any idea about the “low-fat” marketing ploys used by food manufacturers to prey upon your fears after receiving a test like this? I know that my certification in Holistic Health Coaching has benefitted my clients. Now I have a chance to help the most important client in my life … so I can keep him around to see our grandchildren grow up and get married. What can I do to help the most important client in YOUR life?